If you are looking for a unit that provides better protein yields, cuts expenses like labor and handling, lowers energy costs while reducing or eliminating the need for air make-up, mechanical ventilation, or oven hood cost, FWE Commercial Low Temperature Cook and Hold Ovens (LCH) is the perfect fit. The LCH works with little or no air movement, creating a gentle and uniform heat that surrounds the product to cook and hold it at a safe temperature. FWE's unique dual heat system first cooks food to a precise and uniform temperature; then gently holds it for hours upon hours. Once the food has reached the exact desired temperature, an internal probe tells the LCH to switch to "hold" mode, allowing for a natural maturing phase, which locks in moisture and flavor, keeping your menu items at that just-cooked quality and precise serving temperature. 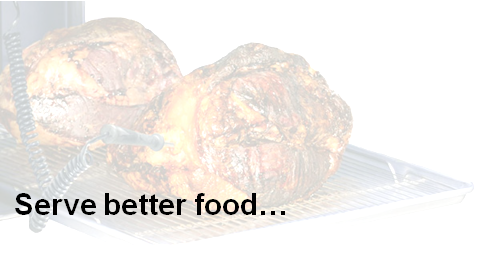 Low and slow cooking stimulates high-yield roasting, moisture, flavor, and even nutrition. This method of cooking offers not only greater quality of cooked food, but also enhanced savings and profits for the operator. In large volume kitchens, saving 10-20% on product yield means extra portions per roast that would have previously gone to waist. These extra servings add up and quickly turn into profits that can be seen day one with your new equipment. Utilizing uniform heat increases yields unmatched with traditional simple roasting, standard conventional or convection ovens. The FWE LCH ovens both naturally brown while reducing meat shrinkage, providing better tasting and textured proteins. Cooking kills off any harmful bacteria that might be on or in the food. Taste - people enjoy the roasted flavors that naturally come from properly cooked food. The cooking process breaks down tough proteins that would otherwise be unpalatable. The Food Safety and Inspection Service has outlined safe time/ temperature data that supports the findings that cooking and holding food at a lower internal temperature is just as safe as quickly cooking to a higher internal temperature. For example, a beef roast should be cooked to 140°F for 12 minutes to be considered safe, whereas the same roast can be cooked to 130°F for two hours and maintain a rare-to-medium-rare result while being just as safe. Collagen connective fibers found in all meat products will start to contract at approximately 130°F to 145°F. When cooking with higher temperatures, even with premium price 'aged' meats, the enzymes will be destroyed and change the chemical breakdown of fat. Low-temperature cooking retains enzymes and the hold cycle promotes natural chemical action to tenderize the meat in the oven. This is why it is critical to allow the product to remain in the hold cycle for optimum and enhanced results. As an added benefit, fresh beef and/or low-grade economical cuts of mean can be used. The more time the meat is left in the hold cycle, the longer the natural enzyme breakdown action occurs and more tender, flavorful the meat. This process works to preserve the natural, nutritional juices for the food- making the purchase of more expensive, aged meat unnecessary. The majority of foods are composed predominately of water. The water (or moisture content) is either inherently static or non-static. Non-static water is essentially the moisture that will leave the product first. This is done either by evaporating, boiling off, or squeezing-out the water from the food product. It is the non-static water content that typically defines what the consumer bases their perception of the quality and texture of the finished product. The lower the temperature food is cooked, the greater the moisture content is retained. More moisture retained means more water, enzymes, carbohydrates, and minerals remain intact, resulting in a more tender product with a better food texture. The FWE LCH oven runs at a lower temperature and therefore requires less energy than typical ovens. In restaurants that require an electric demand fee, utilizing overnight cooking offers even more of an expense advantage. Since the unit is cooking at a low temperature (below 350°F), the use of a hood is not required across most of the United States, local codes prevail. This gives larger kitchens the flexibility to save on space and the expense of having to purchase extra ventilation hoods. Overnight cooking offers labor saving as well. If the product is started before a shift ends, it will cook to a predetermined setting, and automatically switch to a holding cabinet. Without a piece of equipment like this, staff may have to come in early and cook before service time, thus extending working hours and payroll. To save even more, FWE has advanced upon the preset function that has been helping kitchen staff for years. With programmable cooking procedures now available, inexperienced staff can cook correctly and consistently to standardized recipes. Product does not need to be monitored as the LCH ovens automatically switches from cook to hold, keeping your menu items at just cooked-quality and precise serving temperature. When cooking in an FWE oven at 250°F or lower for a longer period of time, outside venting and expensive exhaust hoods are not necessary in most areas (local codes prevail), and also reduce cost of make-up air. FWE ovens help kitchens remain cooler, reducing the cost of air exchange, as well as air conditioning and thus lowering energy costs. The "LCHR Series" expands the cook and hold oven options for both quick-serve and full-service operators to offer proteins that require 'low and slow' cooking processes but don't have the space available for full size floor model units. This series provides big performance in a small package and is sized perfect for smaller volume feeders with constant replenishment, restaurants and food court operations. FWE offers a variety of features and options for our LCH units, visit www.fwe.com/products/low-temp-cook-and-hold-ovens to learn more and get a quote. Several Low Temperature Cook & Hold Smoker Ovens are also offered by FWE. To learn more about our LCH smoker options, vist www.fwe.com/products/smokers. If you are interested in speaking to a sales representative about this product or others that FWE offers, please contact sales@fwe.com.